MR. EDITOR -- Below is a record of all the deaths that have occurred since the time above stated, with the exception of a few cases of varioloid, which have not been sent to us from General Hospital as yet. I will give their names and age, with the disease, and the date of their death. 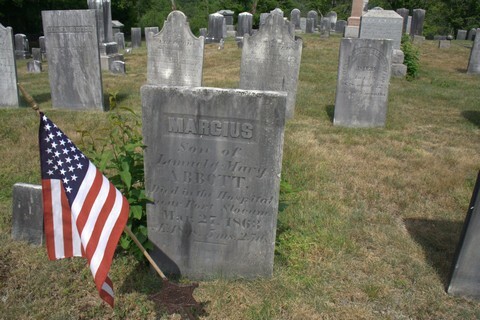 Marcus Abbott, drummer, Co. K., aged 18, of typhoid pneumonia, sent home March 27th, 1863. The above is a true record of all that have died in our hospital, as before stated, making in all ninety-three cases in one year and a half. Perhaps some may think this is a pretty large amount of sickness and death in so short of time; and it seems that thus it is. I have been connected with the hospital department all the time, with an exception of a few weeks. We have things very convenient at present, so that the sick are, and can be well taken care of, and I think they do have all done for them that can be for the place.